In my review of David Drake's The Dragon Lord over at Black Gate, I go on at length about how I was enticed to read the book by a picture by Wayne Barlowe. That picture coupled with my positive memories of reading Drake in the past led me to have pretty high hopes for the book. Alack and alas, they were not fulfilled. There have been a few books I reviewed that I didn't really love, The Magic Goes Away springing instantly to mind. But I hadn't picked that one up with any sort of hopes for it. Niven's book was just another S&S novel to be checked off the great list of unread books carried around in my head. Drake's book was something different. I knew its history of having started as the outline for a Cormac mac Art book so that was enticing. From his killer Vettius stories (and the killer novel Killer co-written with his friend Karl Edward freakin' Wagner), I knew Drake is a master of recreating ancient history. For these reasons alone I was hoping The Dragon Lord would be a good read. Well, maybe I should rephrase that. It's not a terrible read, it's just that it doesn't ever gel as a novel, reading more like a bunch of ill-connected short stories. Each, especially the one about retrieving the Sword and Shield of Achilos, is good in its own way. It's a case of the sum being unequal to the parts. Now that being said, I didn't just want to write a negative review (and no, I'm not one of those critics not writing negative reviews anymore). Negative reviews serve an important purpose, either as a corrective or a warning. But I don't want to be one of those critics given over to savage takedowns. The point of a review should be to explain why something hasn't succeeded or point out when it's egregiously awful, something The Dragon Lord is not. On the other hand, the critic should also be ready to explain and laud the parts of a book that work. That there are good (very good) parts of The Dragon Lord and well worth a reader's time. Drake brings a laudable, workaday attitude to heroic fiction. There's a similarity to the equally unflashy Glen Cook to Drake's S&S which I find very satisfying. 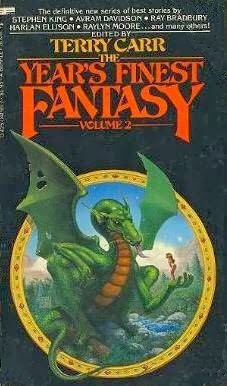 It may not be straight line, but there's definitely a line between Drake's fantasy stories and the more "realistic" fantasy being written now by the likes of Abercrombie and GRRM. I think my review presents adequately the failings of The Dragon Lord without neglecting its good parts. Right now I'm reading a bunch of stuff. I'm starting Andre Norton's Year of the Unicorn today and Sunday I started Carole McDonnell's The Constant Tower. 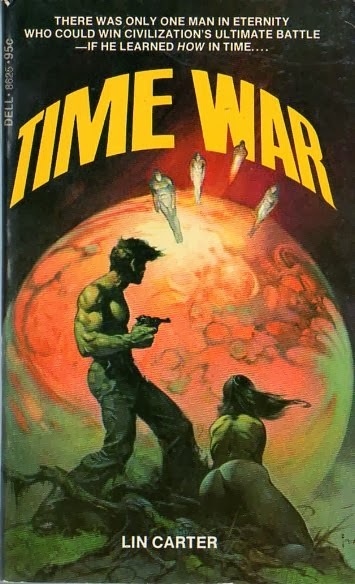 I'm also still reading the second of Max Allan Collins' Nolan books and I'm dipping into Harold Lamb's Swords from the West a story at a time. I haven't read like this since grad school. It's actually a little tough, but a good tough. My music this week didn't switch over to heavier stuff from Britpop, just different British trad rock. I watched an entire concert of Beady Eye, a band formed from the remnants of Oasis, filmed at the Empress Ballroom in Blackpool. Not bad, even if they can't wrangle together a song like Noel Gallagher could. They've got a rock star swagger that most bands these days lack. Then I dug out my Ocean Colour Scene albums. They're not as quadraphonic and technicolor as Oasis or spacey as Cast, but they're solid through and through. They've got a natural soulfulness and swing that meshes well with their very British-ness. 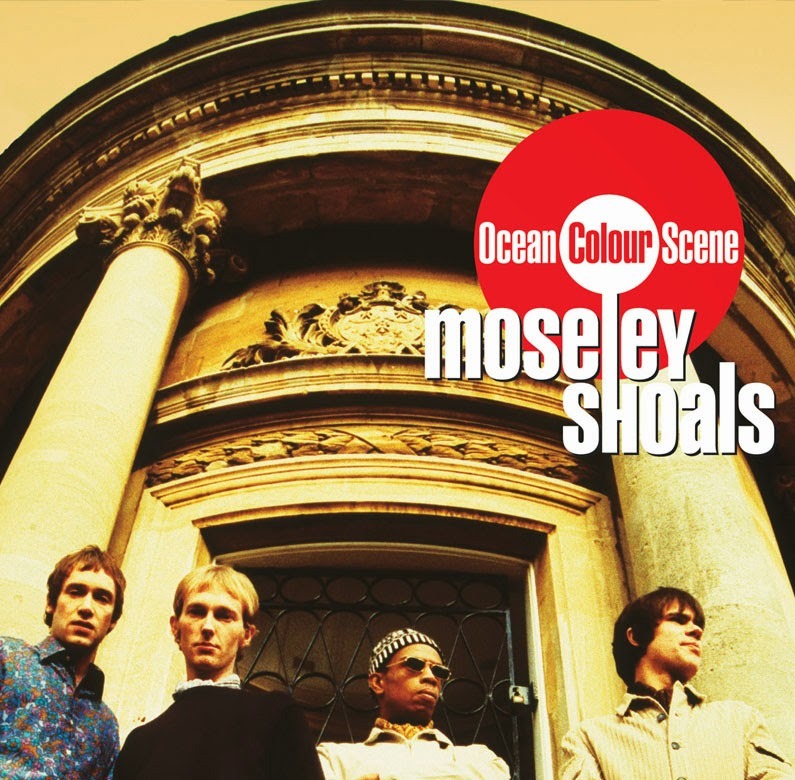 I replayed "The Riverboat Song" from Moseley Shoals in the car today and its opening riff hit me the same way it did nearly fifteen years ago when I first heard it. Seeing them live in about thirteen years ago was great. Blistering on the heavy tracks and sweet on the soft ones. They ended the show with the Small Face's "Song of a Baker". It rarely gets more British or cooler than that. A bunch of new purchases that I'll only get around to reading slowly. Still, I had some Amazon credit and why waste it on household goods when there are books to buy? 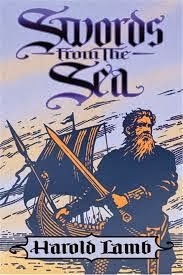 The Howard Andrew Jones edited collection of Lamb's viking and other nautically themed stories. Bought this because Howard Jones recommended it on his site and made it sound like a blast - and it's only $1.99. I became pretty caught up with the Crusades while reading Count Bohemond. Learned about King Baldwin the Leper and his near miraculous defense of Jerusalem in 1177 and found about this book covering that battle. Sounds fun and has a story by David West so figured it was worth a go. My review of Alfred Duggan's Count Bohemond just went up over at Black Gate. Not a crusade adventure like the stories of Lamb or Howard but a more sober examination of one of the period's towering figures. I only know of the writer Alfred Duggan because my dad had a copy of Count Bohemond in the attic. 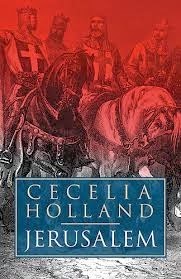 I only knew it was related to the Crusades because of the REH story "The Track of Bohemond" in The Road of Azrael. I only picked it up last week to read for review because I want to mix in some historical fiction along with the usual S&S. You know, to class up the joint a bit. Seriously, because of S&S's deep roots in historical fiction and that there's a lot of similarities between the two genres, I thought it made sense to add some of it to my reviews. Tons of great old stuff is out there and plenty of new stuff's being written right now. I can't imagine any fan of S&S or heroic fantasy wouldn't be open to trying it out. I really don't know much about the Crusades. Most of what I knew until this past week was a mix of old romantic notions of the crusader period and the modern anti-imperialist condemnation of it. I think I have a little better grasp of the age now because almost every other page of Duggan's novel sent me to my copies of my books on the subject including Geoffrey Hindley's The Crusades, Zoe Oldenbourg's The Crusades and the Alexiad by Anna Comene. that Anatolia could be recovered and the Westerners' that the Holy Land could be recovered and the centuries of Muslim victories overturned. At a time when warfare was endemic and pacifists scarce on the ground the crusaders were no better or worse than any other army. This may get me in trouble but I've never quite understood the animus some people seem to have towards the Crusades. There were horrible atrocities but sadly nothing rare for, well, pretty much the entire history of mankind. Some call them unprovoked but the reality is they were a response to centuries of defeats. When they failed the aggression from the East continued for another five or six hundred years. When did Greece win its independence from the Turks? It's not until the middle of 19th century that the West emerged the clear victor in the war with the East. Anyway, that's my take. This week's music was almost exclusively Oasis. I'll probably get that worked out of my system in week or two. I imagine I'll get back to the heavier stuff after that. So these books run a very high risk of stinking but I remain curious. The thing is, my dad was as big a fan as any one could be of Carter's books and had these two in one of those attic boxes I alway mention. and they always caught my eye. The Black Star is probably one of my favorite Frazetta pictures. I've got a lot of stuff I'm hoping to get to this year but I think I need to pull these out of the attic and put them on the TBR stack. 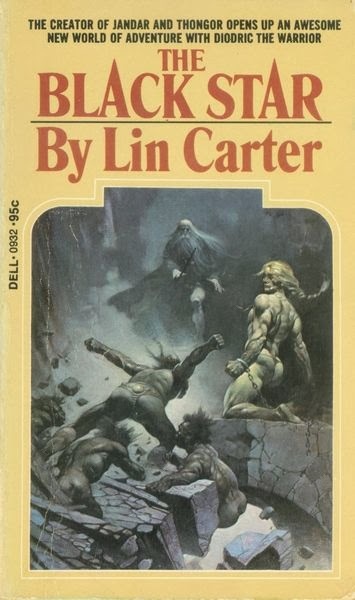 I wrote to the editor of Black Gate that I miss Lin Carter every time I read a batch of short stories. 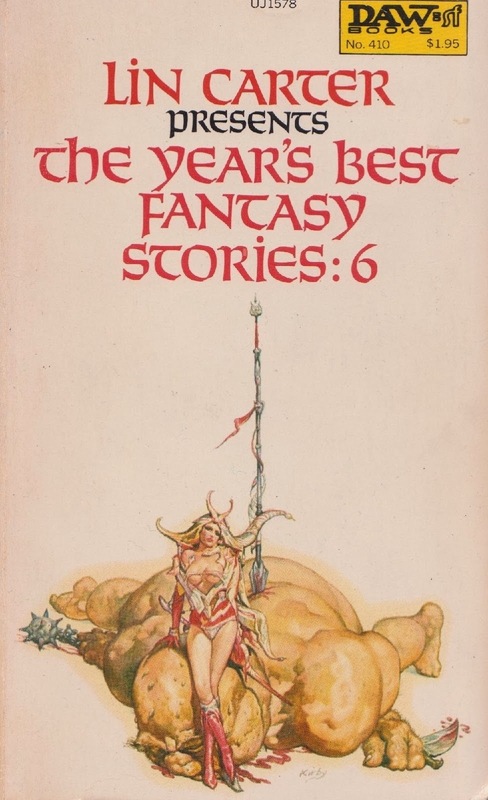 I'm wistful for the days of my youth when every year was saw heroic fantasy anthologies from Carter and a host of other talented editors. Now, I have to make do with the occasional volume like the relatively recent Swords and Dark Magic. If I keep my eyes open I can catch something like Artifacts and Relics but books like that are just all too rare these days. I know I'm always harping on it but I'd just like some reasonably sized books. Whatever. In keeping with my hope to read more historical adventure fiction I've started Count Bohemund by Alfred Duggan. It's about one of the leaders of the First Crusade and has an effusive foreword by his friend Evelyn Waugh. 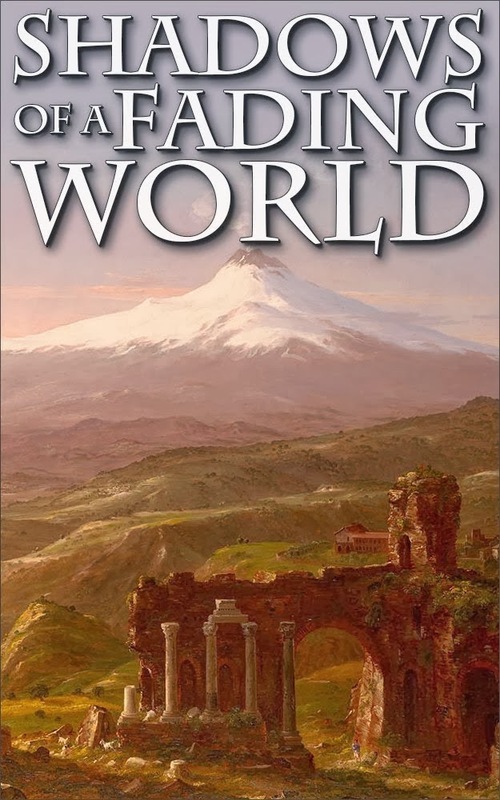 The next historical book I'm going to read is the Harold Lamb collection Swords from the West edited by Howard Andrew Jones. This week I broke out my Britpop albums. Oasis figured heavily in the mix. People can give Noel Gallagher grief for being arrogant and say his lyrics are simplistic. I can't argue with that. The thing is, Oasis set out to be a ROCK BAND. The lyrics are really there to give the crowd something to sign along to instead of just hollering. He's also accused of pilfering too much of his sound from previous musicians. I don't think it's any worse than most. He also knew how to take familiar sounds and forge them into something that could get sixty thousand people singing along. What made the band potent were their wall of sound approach to music and their swagger and braggadocio. Noel Gallagher said he wanted their first album to sound like an airplane taking off. From the first note of "Rock and Roll Star" it's clear what he meant. They went off the tracks over the years but their first two albums, Definitely Maybe and (What's the Story) Morning Glory? still shine. I've also been listening to Cast, a band formed by John Power from the La's. They were pretty much the exact opposite of Oasis. They're more heartfelt and their lyrics hippieshly cosmic. Their songs exude a positive upbeat vibe that's hard not to appreciate and get you smiling. Their first album All Change is a blast of fun. I love even their supposed failure of an album, Beetroot. They've reunited but I doubt they'll play the States any time soon. Still, I've got my fingers crossed. So I've triggered a Glen Cook-athon for myself. First I blog about his short stories, now I'm preparing to delve into the Dread Empire series (not the two El Murid books. I've read them in the past five or six years). 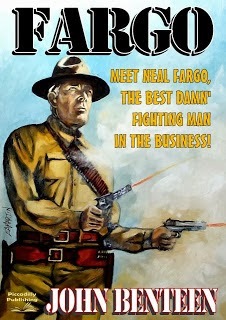 I might even hit the Black Company books later this year. 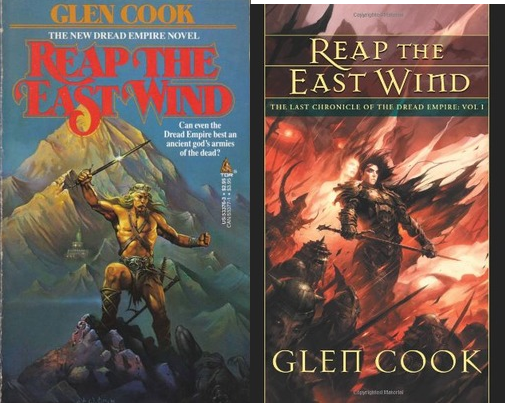 So here are the covers of all the Dread Empire books as they were first published and as Night Shade republished them thirty years later. Really not a lot of good stuff except for the two Night Shade omnibuses, A Fortress In Shadow and A Cruel Wind. There's definitely a pulpier sensibility to the earlier books. The newer covers, while clearly genre books, have a similarity to the WotC-era D&D stuff and computer game boxes. There's a certain homogeneity to too much modern "geek culture" products and these feel of a piece with that. Not to my tastes, but the new covers definitely make the books look like they're of this age and not three decades ago. The original covers for the El Murid books. The originals really are not that good. There's a dullness to them, especially for The Fire In His Hands. The cover for the later omnibus is by Raymond Swanland and is much more vivid. 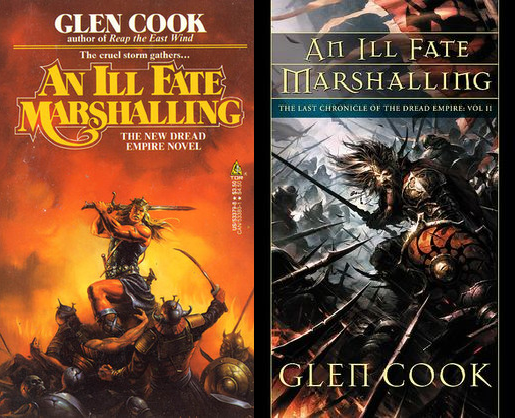 The first three are covers I've griped about before. A Shadow of All Night Falling has characters who look unfinished. October's Baby, well, I'm just going to say look at it yourself. All Darkness Met isn't that bad. 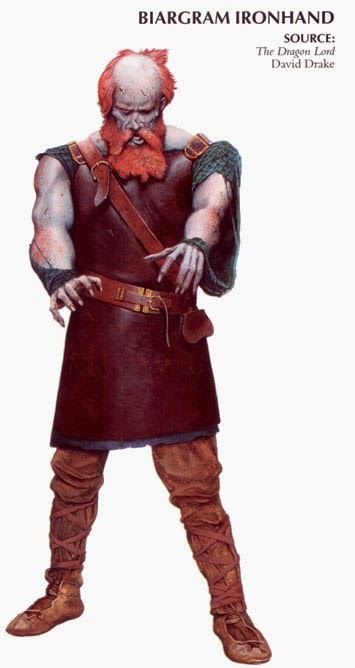 I don't really love the look of Bragi Ragnarson but the princess and the tiger in the background give it a nice pulp feel. 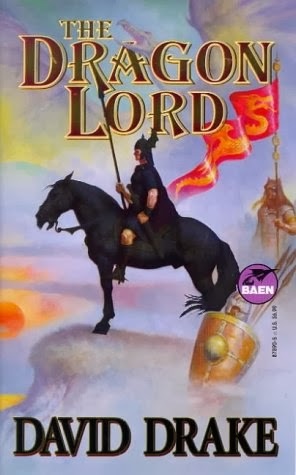 Swanland's cover for the A Cruel Wind omnibus is, again, vivid and bold and provides a nice hint of the epic awesomeness of the battles against the Dread Empire. Well, what can I say? I can say the original covers to the left stink. There's no excuse for them unless lunatics were in charge of the art department. Now those are by Ken Kelly, artist of some of the best REH covers but here his style is awful and a total disservice to the books. On the other hand, Swanland's work for the gaming industry comes through loud and clear in his covers on the right and I don't like them either. There's too much stuff/gear/accoutrements on the characters and I find the armor too busy. 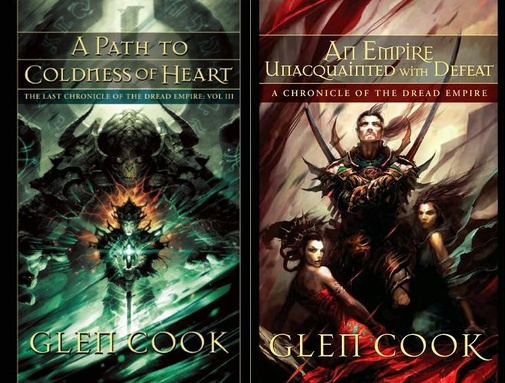 They're not all that different from the other Dread Empire covers he did but I find myself irritated by these. These exist only with Swanland covers. Not having read A Path to Coldness of Heart my reaction to this is purely visual. I don't like the big brain guy, nope, I just don't like him. 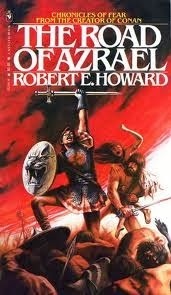 My complaints about Empire are the same as about the previous two Swanland covers - too gamey. I'm also pretty sure no image like that ever even occurs in any of the stories. In the end, I don't buy books based on the cover (oh, that we could). Presumably the art's chosen to help move copies of the book. 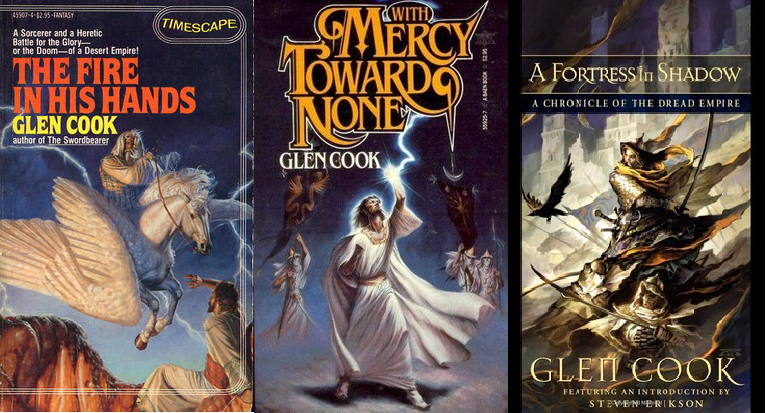 While I'm not a fan of much of the new fantasy cover art I'm no expert on what sells and what doesn't. But I can complain, and that I'll keep on doing. 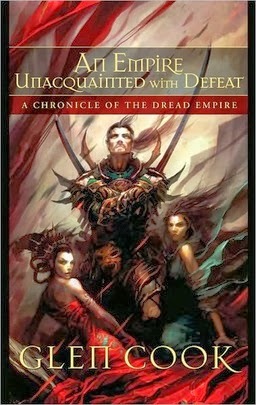 My review of Glen Cook's Dread Empire anthology An Empire Unacquainted with Defeat. Considering it contains my FAVORITE STORY by the man, I had high hopes for this one. Unfortunately, those hopes were brought to Earth by fact that most of the stories are only ok. Still, if you're a fan of the man (and if not, why not? ), it's worth having on the shelf. His foreword and intros are informative and funny. They have the same sort of direct quality of his fiction. He cites "Severed Heads" as being one of his personal favorite stories because it earned more from foreign reprints than many of his novels. It's rare I read (maybe I'm not reading the right things) an author talking about money. 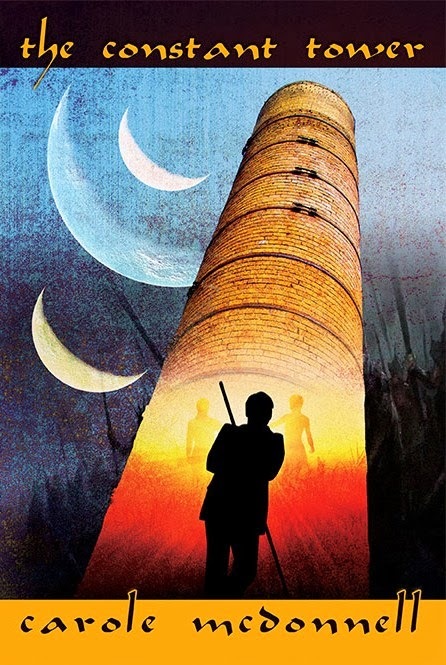 I think I need to read the Dread Empire series from A Shadow of All Night Falling to the concluding volume, A Path to the Coldness of the Heart. I remember how excited I was when I reached the battles mentioned in "Filed Teeth" and they way exceeded my expectations. Great, awesome stuff. I'd love to see if the books can still get that sort of reaction from me. After that maybe I'll reread all the Black Company books. Now don't freak out when I say the music I've listened to this past week was mostly by the Monkees. Some of the best pop songs ever came from those guys. Don't tell me about them being manufactured. Sure, Mickey Dolenz and Davy Jones weren't real musicians but they learned how to sing the heck out of a song. Listen to Headquarters or Pisces, Aquarius, Capricorn & Jones Ltd. and not at least hum along. I actually came to the Monkees sort of backwards. The show was on when I was a kid and you'd still hear some of their hits on the AM music station but I never really thought about them much. In 1992 I heard a review of Mike Nesmith's Tropical Campfires on NPR and picked it up. I've been a fan ever since. Listening to that and other albums of his led me to check out the Monkees. Pretty quickly I discovered they were pure fun. If you like good sixties pop check 'em out.